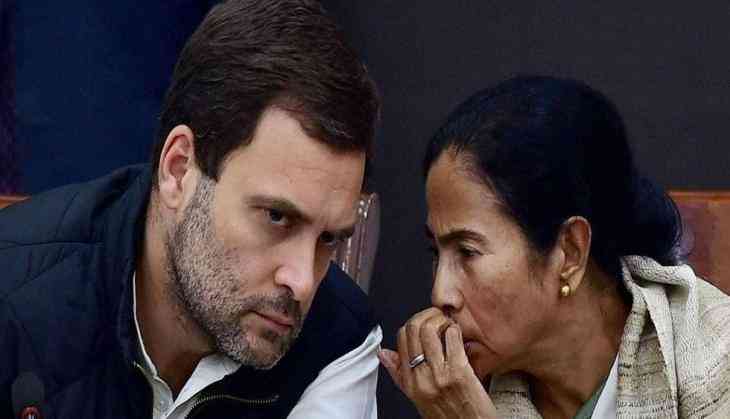 Opposition parties late Sunday night expressed solidarity with West Bengal Chief Minister Mamata Banerjee, who began a sit-in protest over the CBI's attempt to question the Kolkata Police chief in connection with chit fund scams, as the Congress termed it "mala fide" and an "assault" on the federal polity. He alleged the events in West Bengal were part of an unrelenting attack on India's institutions by Prime Minister Narendra Modi and the BJP. Andhra Pradesh Chief Minister M Chandrababu Naidu said it was a glaring example of how "Modi-Shah duo are destroying the institutions". "Attacking political opponents in different States, few days before the Parliament elections commence, will have disastrous consequences in the country," he said. Delhi Chief Minister Arvind Kejriwal also came out in support of the TMC chief. "Spoke to Mamta didi and expressed solidarity. Modi-Shah duo's action is completely bizarre and anti-democracy," he tweeted. Samajwadi Party chief Akhilesh Yadav termed the CBI's action undemocratic and against the spirit of the Constitution. "The BJP wants to stay in power by hook or by crook. They are so scared of losing that CBI is being used as election agents. This is undemocratic and against spirit of the constitution. We demand due process be followed so that CBI is not used as a tool of political interference," he said on Twitter. Congress spokesperson Abhishek Singhvi said the CBI action in Kolkata is clearly "mala fide" and an "assault" on the federal polity, which has come within 48 hours of Modi and BJP chief Amit Shah's public "threat" to him. He alleged that the BJP and the prime minister are desperate to create a controversy in the state for "cheap publicity and divisiveness" to get some space in 2019 elections. Congress leader Ahmed Patel said, "Investigative agencies are constitutional bodies and need to operate within the parameters of law. "They cannot act at the behest of any political party or any extra constitutional authority." Rashtriya Janata Dal national president Lalu Prasad said the Constitution and constitutional institutions in the country were facing an "unprecedented crisis" and alleged that there were "attempts to plunge the country into a civil war". Prasad's official twitter handle is operated by people close to him as he is serving sentences in connection with fodder scam cases and admitted at a hospital in Ranchi for treatment of multiple ailments. Incidentally, the fodder scam conviction which led to the imprisonment of Prasad and rendered him disqualified from contesting polls, was also investigated by the CBI. NCP president Sharad Pawar wrote on the micro-blogging site," #Assualtondemocracy - blatant misuse of CBI in #WestBengal to intimidate the opposition and settle political scores." National Conference leader Omar Abdullah also threw his weight behind Banerjee, saying the use of the agency as a political tool has crossed all limits. Former Jammu and Kashmir chief minister Mehbooba Mufti also expressed solidarity with Banerjee, saying history stands testament to how JK has faced the wrath of central agencies. She said, "Its disheartening to see how institutions are being hijacked only to discredit political opponents. Doesn't bode well for the Centre-State relationship." In a dramatic showdown with the Modi government, a furious Banerjee, wrapped in a brown woollen shawl, began a sit-in right in front of the Metro Cinema to protest "insults" she faced at the hands of the prime minister and Shah, hours after a CBI team that had gone to question Kumar was detained in a rare face-off between the police establishments of the Centre and the state.